Karl Mannheim’s Ideology and Utopia has been a profoundly provocative book. The debate about politics and social knowledge that was spawned by its original publication in 1929 attracted the most promising younger scholars, some of whom shaped the thought of several generations. The book became a focus for a debate on the methodological and epistemological problems confronting German social science. More than thirty major papers were published in response to Mannheim’s text. Writers such as Hannah Arendt, Ernst Robert Curtius, Max Horkheimer, Herbert Marcuse, Helmuth Plessner, Hans Speier and Paul Tillich were among the contributors. Their positions varied from seeing in the sociology of knowledge a sophisticated reformulation of the materialist conception of history to linking its popularity to a betrayal of Marxism. The English publication in 1936 defined formative issues for two generations of sociological self-reflection. 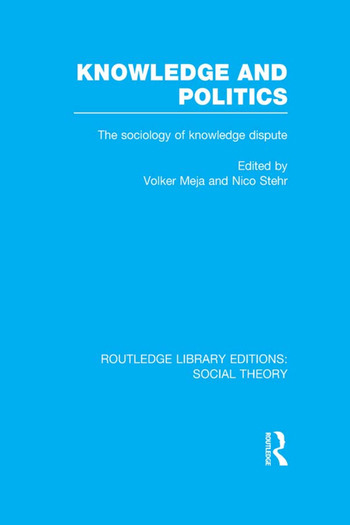 Knowledge and Politics provides an introduction to the dispute and reproduces the leading contributions. It sheds new light on one of the greatest controversies that have marked German social science in the past hundred years.